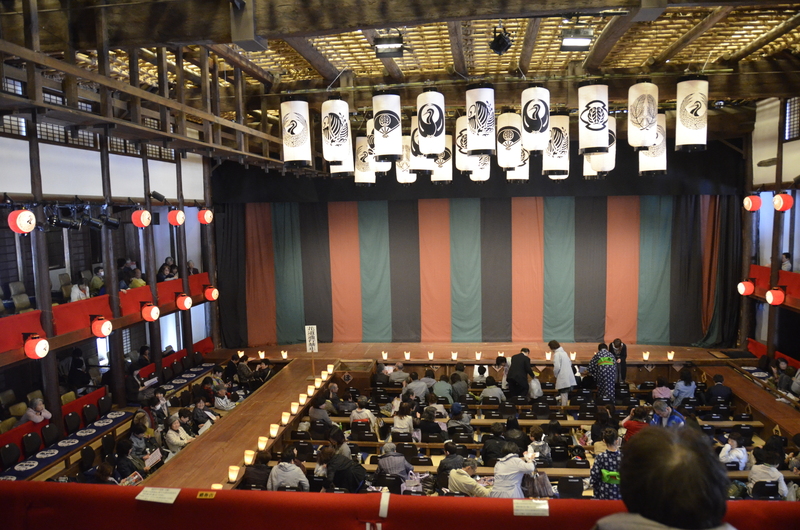 While we were visiting friends on the island of Shikoku, our hostess looked at various events and discovered that the Tokyo Kabuki theater comes to Shikoku and performs during the month of April in the historic Konpira Grand Theater (金毘羅大芝居). 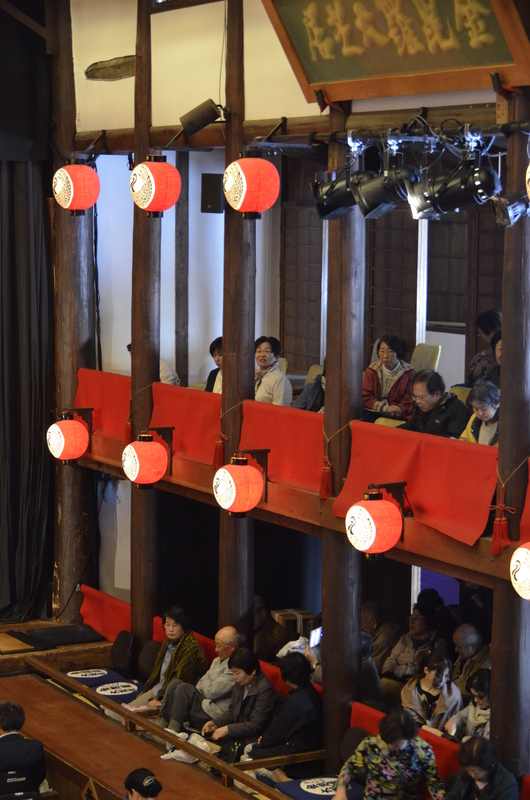 This is the oldest original Kabuki theater in Japan and is located in Kotohira, Kagawa Prefecture. 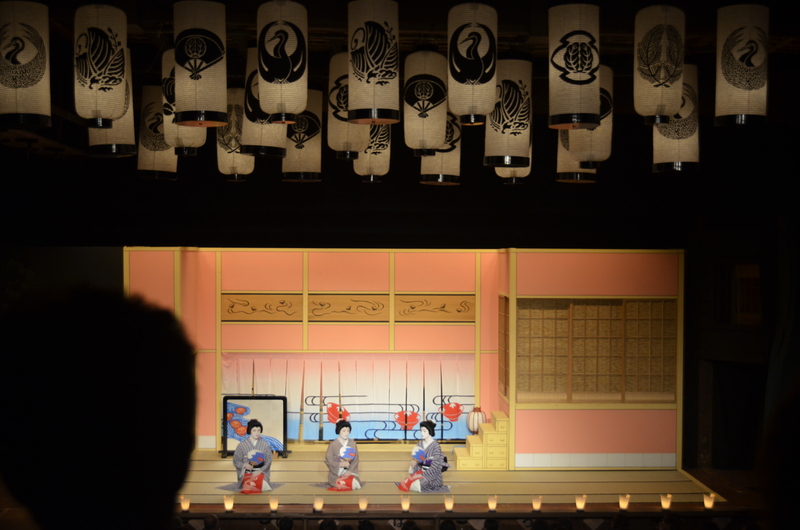 Other kabuki theaters were damaged or destroyed due to earthquakes and the bombings of WWII. The seats were flat spaces with thin cushions. At least there were chair backs against which to lean, but for us Westerners, especially tall ones like me, I had to shift many times between cross-legged style and legs to the side to survive the entire performance. Certainly my knees were thankful during intermission and at the end to stretch when I could stand again. Below us people sat in similar flat square seats with seat backs. But instead of aisles, people had to walk along narrow plank catwalks to get to their seats. Between the tall stairs and narrow catwalks, one must remain lithe, limber, and well-balanced to visit the kabuki theater! 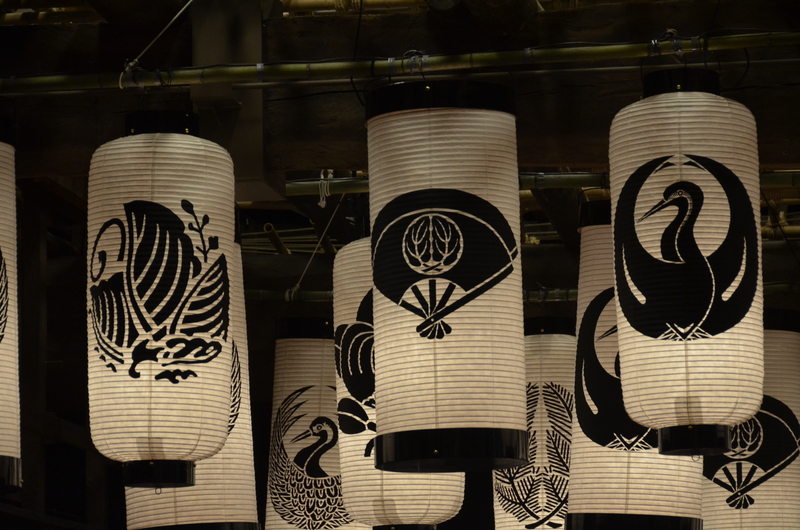 The ceiling of the theater was covered with many lanterns that sported beautiful designs, possible family crests known as kamon ( 家紋). Seated at the far right edge of the stage was a woodblock percussionist. As curtain time approached, he would hit a woodblock once. As the time got closer, he struck twice, then thrice, then multiple times as the curtain was quickly opened. Instead of rising, the curtain was whisked quickly to one side like a drapery on a curtain rod. Following tradition, all the roles were played by male actors. Those who played women were amazing in their movements and voices. If one did not know, they might easily be unaware there were no female actors. 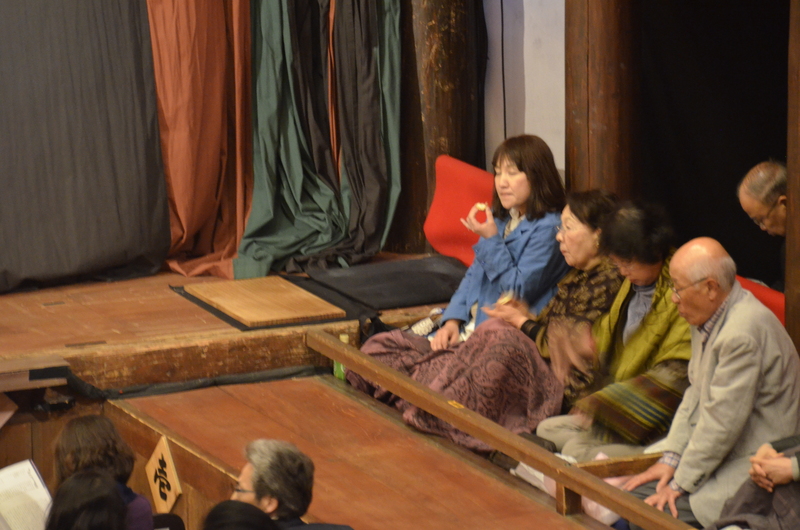 The play was “Ise Ondo Koi No Netaba,” first performed in 1796. It was based on an actual murder and involved a spurned lover, revenge, foiled plans, a geisha house, and a cursed, bloodthirsty sword. As the main actors entered the stage, it was common for members of the audience to clap. It reminded me of melodrama plays I’d seen where there was interaction between audience and the characters on stage. When players ran off the stage, the woodblock percussionist would often clack the blocks in time to their running footsteps. 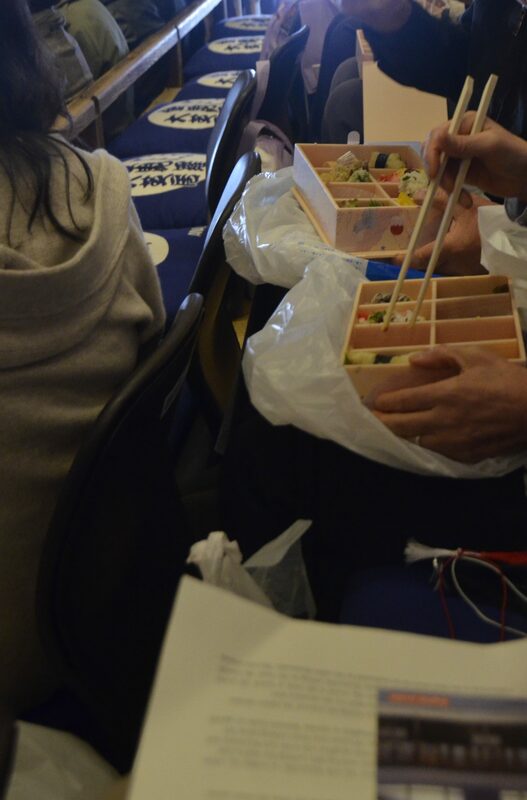 During intermission, we pulled out our boxed lunches and drinks and consumed them at our seats. Although the whole play was in Japanese, we were given English programs that described of the plot. The costumes and sets were bright and colorful; and again, the female characters were amazingly acted by the male actors. 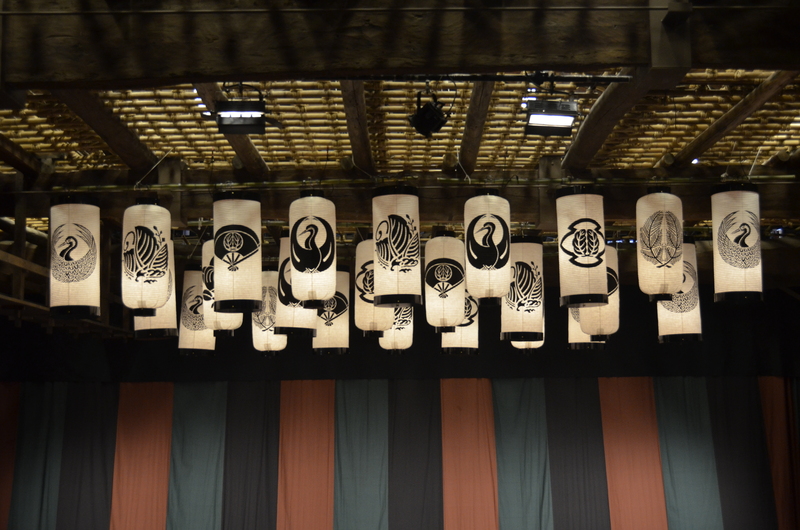 Kabuki is not inexpensive, but if you have the chance to see it, it’s quite an experience!